The Main North: My Revised Signalling Theory & the SCMRA Epping Seminar. 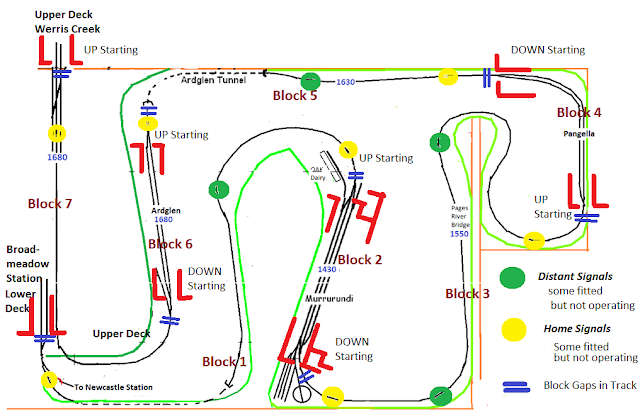 At this year's SCMRA Epping Seminar, I did a Clinic describing the way I've signalled a 40 metre single line section on my Main North layout to provide bi-directional running by rehashing my Jan 2017 Semaphore Signalling Blog entry, where all the Operator has to do, is set his road (Points) and closely observe the Signals. The rest is automatic. 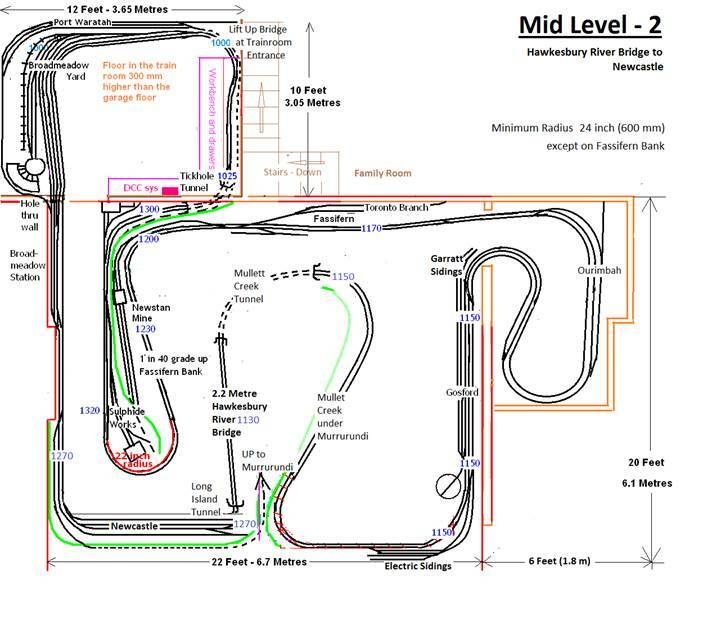 Instead of using text and photos of the spaghetti jungle under the layout, I made a schematic of the "electrics". Operating the Control Panel Toggle Switches if appropriate, provides a "ground" for a Red and an "open circuit" for a Green, "input" to the Octopus III to operate the Semaphore's Servo. With occupancy of the Block "ahead", the appropriate two GREEN Signals are positioned to RED, shown below. BOTH Operators have a Green. Who goes FIRST? Either one but as soon ONE moves into Block 2 the OTHER has a RED. Make sure "your" Signal is green before passing it. I could add some sort of time delayed removal of track power, in this above scenario, to Blocks 1 and 3, to correct a slack Operator not paying attention to his Signals - lots of time and effort. It is much easier to banish a serial offender to make the Coffee. The above circuitry is repeated 4 times for Blocks 1, 3, 5 and 7, see below, to only provide one train in the Block. Trains are allowed to pass in Blocks Broadmeadow, Blocks 1, 3, 5 and Werris Creek. Home and some more Distant Signals will be added later. These are held in April at the Epping Creative Center here in Sydney, focusing on the railways of NSW with lots of prototype and modelling ideas etc. Each year there is a "theme". Keep an eye out for details in AMRM etc. 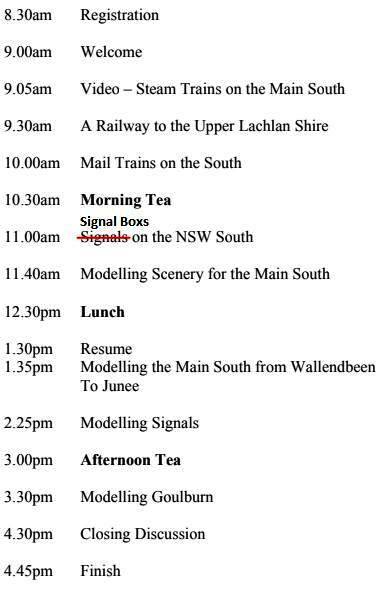 This year it was "The Railways of Southern NSW", with the schedule of the Day copied below. In each Seminar, numerous Clinicians talk/demonstrate about a topic, in this case, about the Main South. While my talk was not exactly about the Main South, I showed how to implement Semaphore Signalling in the "South", similar to what I've done on my Main North. These Days are excellent for NSW modellers of any era. I hope to see you next April. The Whiteboard had a list of suitable themes for 2019, with the "Main North" having the highest interest (and I only voted once). Fantastic- right up my alley. 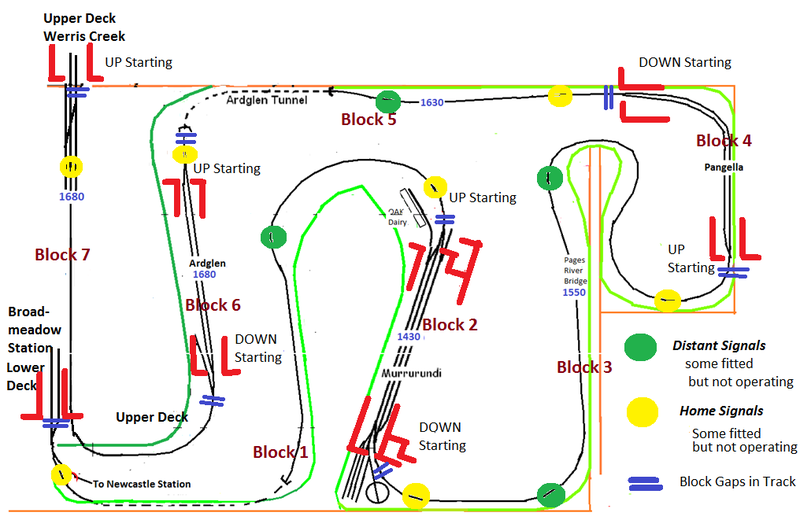 I will do a Clinic and offer a visit to my Main North layout. Hi Rob. 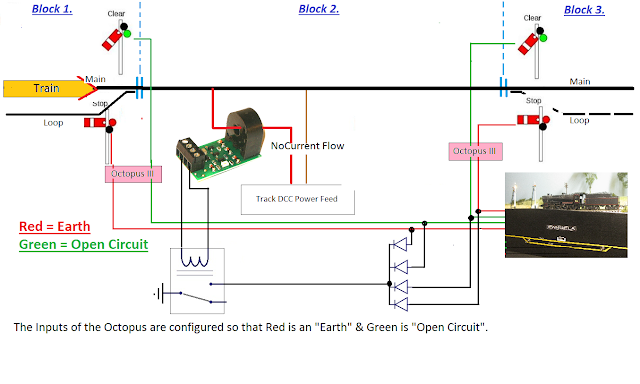 If you use 2 Aspect Colour Light Signals, it is so easy. 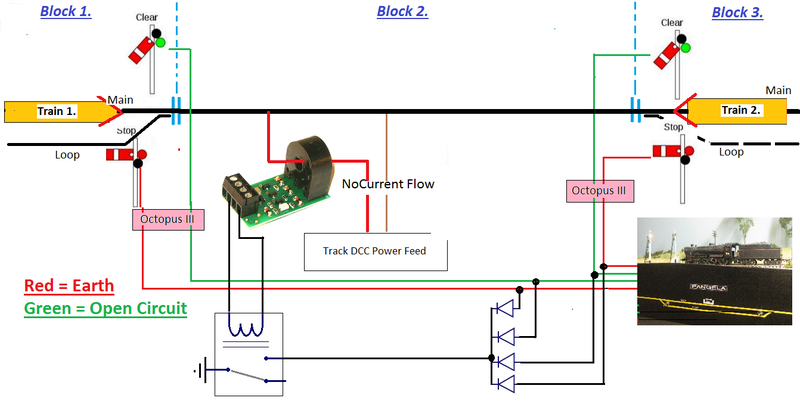 An Occupancy Detector like a NCE BD20 or similar, no Servo Driver (Octopus III) necessary. Contact me if necessary via an email or phone me. Regards Marcus.